This year for my birthday I asked people to get me Amazon gift cards so that I could buy a new food processor, the food processor of my dreams. Our current food processor came to us free from a yard sale (the girl didn't know how to work it so she just let us have it) and it has served us well for five years. It is definitely the most used appliance in our kitchen and my original plan was to keep it until it died. Five years later it is still going strong, but since it is too small for our needs and since my sister needs a part-time food processor I decided this is the time to buy. I have had the gift cards since my birthday, but I made myself purge the kitchen of useless appliances and kitchenware before I let myself buy it. I finished purging and placed the order and today a shiny new Cuisinart arrived at my door. I love birthdays!!! Woo, nice! I should use mine more, but the noises scare me! 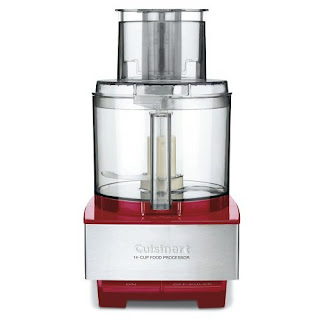 I know what you mean, growing up we never had a food processor so the first few times I used mine it freaked me out. Now, I am totally used to it.